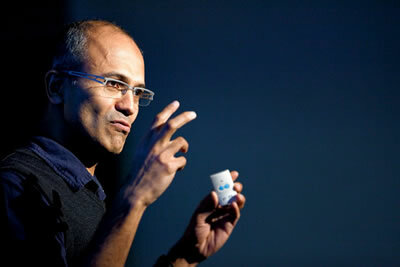 Satya Nadella is the third Chief Executive Officer of Microsoft, after Bill gates and Steve Ballmer respectively. Education: Hyderabad public School, Manipal Institute of Technology (Manipal, Karnataka), University of Wisconsin - Milwaukee, United States, and University of Chicago Booth School of Business - Chicago, United States. Satya Nadella was announced as Microsoft’s new CEO, on February 4, 2014. The corporation had a choice between the in-house Nadella and the car-maker Ford’s Mullaly, after former CEO Steve Ballmer decided to step down from his post in August 2013. 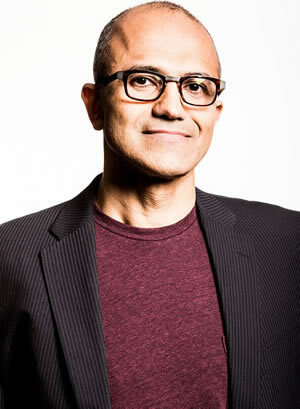 Satya Nadella, born as Satyanarayana Nadella, belongs to a Telugu Brahmin family from Hyderabad, which is also his city of birth located in Andhra Pradesh, India. His father B.N. Yugandhar was an IAS officer, who was also a member of the planning commission from 2004-2009 under Prime Minister Manmohan Singh. Satya went through his schooling at the Hyderabad public School, in Begumpet area of the city. He then graduated in electrical engineering, from the Manipal Institute of Technology near Mangalore, Karnataka. However, he soon found out that his passion actually lied in the subject of computer science, which he went on to pursue from the University of Wisconsin – Milwaukee, United States. Finally, he rounded off his education with an MBA from the University of Chicago Booth School of Business - Chicago, United States. Being born in India, Cricket came naturally to Nadella. He believes that the sport has taught him a lot about team work and commitment towards a collective goal. He’s also an avid reader and especially enjoys poetry. Regarding poetry, Satya says this: “You’re trying to take something that can be described in many, many sentences and pages of prose, but you can convert it into a couple lines of poetry and you still get the essence, so it’s that compression”. Nadella first worked at Sun Microsystems, before switching to Microsoft in the year 1992. Nadella’s work at Microsoft pits him as one of the most influential employees of the software giant. He was an integral part of many departments such as the research and development department for the Online Services Division, Microsoft Business Division, Server and Tolls department, etc. Nadella is married to his long-time spouse Anupama Nadella, who shares two daughters and a son with him. The Nadella family lives in Washington DC, USA. Satya has revealed that his family is his true strength, and firmly supports him as the new CEO of Microsoft, who’s aiming to take the corporation to even greater glories in future.